I found this exposed waterproof metal junction box. Entrances for cables and the lid have rubber gaskets to keep water and damp out. Very common back in the days, have become a bit more rare by time but we still use them now and then. This particular one is as you can see made for max 4 cables. Someone wanted to connect 6 so he drilled two holes (on the right) in which he inserted them. I doubt the box was still waterproof after that. It's a bit different from boxes We have around here, but the violation is easy to spot. Is that piece in the middle of the box for conductor arrangement or are those Grounding posts? It's a little difficult to see what they are or could be used for. Looks very similar to some Briish weatherproof junctions, except for the design of the terminal posts. Sorry for answering a bit late. The 4 screw connections in the middle are terminal posts. The grounding posts is located at the edge of the box between the holes (it’s hard to see it on the photo). Ahhh, so the posts are used for splicing? That's why you were asking about wirenuts. What happens when you have more than 4 conductors to splice in a box like this, what do you use to make the splice? Our British junction boxes for internal use with PVC-sheathed cable are also round plastic boxes fitted with terminal posts (different design though). The boxes have entry points for up to 4 cables, and the commonest types have 3 or 4 terminals. The 3-way boxes are normally used on circuits for feeding sockets etc. where there's only line, neutral, and earth to connect together. The 4-way types are most often used on lighting circuits, the extra terminal being used for the switched feed to the light. The 4-cable capacity of the box provides for power in, cable to switch, cable to light, and power out to the next light or junction. It's also possible to get 6-terminal boxes, which are commonly used for 2-way (American: 3-way) light switching. What happens when you have more than 4 conductors to splice in a box like this, what do you use to make the splice? If you must splice more than 4 (5 if you count the ground) you have to use some sort of wirenut and make a splice beside the terminal posts. 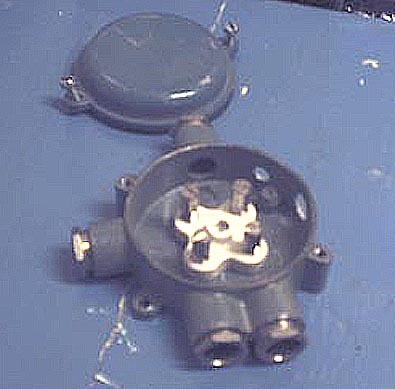 Remember, this is a pretty old model of junction box so we don’t use it everyday. Have a pic (I provides you with a lot of extra work Bill)of a more modern waterproof box made of plastic. This one has 6 terminal screws and if you like (I do) you remove the terminal posts and use wirenuts instead. I prefer the “ Screwless spring pressure” models from the Wago Corp (the small pictures to the right). Very easy to use and never any problems with bad connections which sometimes could be the case with the twist on wirenut. Do you use Wago over there? Then we have other boxes for domestic indoor use. They look a bit nicer and are only half the size. Thanks, those pictures seem to work ok if you provide a link like that. I haven't seen anything like your Wagos over here. They look like they take up a lot of space. Are they reusable? I assume they can only be used on solid wire and only certain sizes? The Wago corp. Have an online product brochure. Make a visit at this address (you need Acrobat Reader).